- أربعة أيام متواصلة من السبت ٢٢ ديسمبر إلى الثلاثاء ٢٥ ديسمبر 2018. - أربعة أيام متواصلة من السبت ٢٩ ديسمبر إلى الثلاثاء ١ يناير ٢٠١٩. يقدم الدورة فضيلة الشيخ الدكتور عبد الله بن يوسف الجديع رئيس المجلس الأوروبي للإفتاء والبحوث صاحب المكانة العلمية المعروفة في الشأن الإسلامي المعاصر وفي علوم الحديث خاصة، والذي يشارككم معرفة المتغيرات من أحوال الأمة، مع المعايشة المستمرة للواقع الأوروبي ومستجداته. تضع هذه الدورة الشباب المسلم المثقف أمام مسؤولياته تجاه الحديث الشريف. كما تهدف إلى إعادة علوم الحديث إلى دائرة الاهتمام والبحث والدراسة الجادة بشكل يتناسب مع الاحتياجات المعرفية الحالية، وبطريقة تتعامل مع التيارات الفكرية المعاصرة. يقوم بذلك متخصص في هذا العلم، أفنى عمره مهتمًا به ومنكبًا عليه، يواجه الشبهات ويستخلص الأحكام، مجيبًا عن أسئلة الشباب في أوروبا وغيرها. هي فرصة للشباب المقبل على تعلم دينه أن يحصل من علوم الحديث على القدر الذي يمكنه من فهم علم قواعده وأصوله لتكون له إسهاماته الفكرية في التعريف والذب عن أصل عظيم من أخص مصادر التشريع الإسلامي هو (السنة النبوية). Anyone familiar with the sources of Islamic legislation knows that the Sunnah represents alongside the Holy Quran the authentic texts to determine the provisions of the religion of Islam. They are the utterances of the Prophet, peace be upon him, as revealed by Allah, and Allah ordered us to listen and heed them; and so continued the doctrine of Muslims since the dawn of Islam. These days, and to the general educated and practicing Muslim the fierce attack on the prophetic Sunnah by various sects, which are skeptical of its transmission and preservation, and the emulation of its importance in Islamic legislation is no secret. This is but one step in the attempt to destroy Islam by weakening or undermining confidence in its original sources. Four consecutive days from Saturday 22 December to Tuesday 25 December 2018. Four consecutive days from Saturday 29 December to Tuesday 1 January 2019. The course will be presented by our dear respected Sheik Dr Abdullah Bin Yusuf Al-Judai, President of the European Council for Fatwa and Research, who has a well-known scholarly standing on contemporary Islamic affairs and in the science of Hadith in particular, who will share with you the knowledge of the challenges that the Ummah in this respect, while bearing special attention to the role of coexistence in the European milieu. This course places educated young Muslims before their responsibilities towards Hadith. 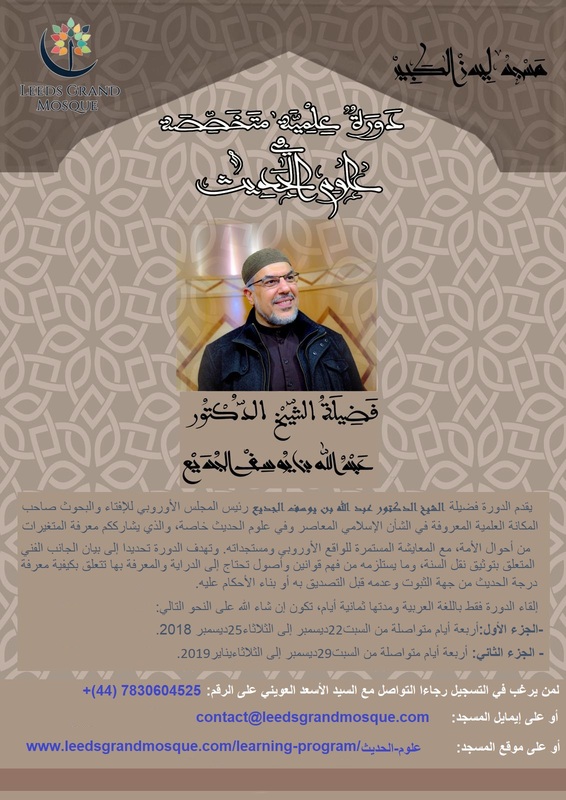 This is done by a specialist in science of the Hadith, who spent his life passionate about it, facing suspicions, drawing judgments and answering the questions of young people in Europe and others. It’s an opportunity for young people who are keen to learn about their religion to get the science of the Hadith to the extent that will allow them to understand the science of its rules and origins to allow them to have their intellectual contributions to present one of the great sources of Islamic legislation which is the prophetic Sunnah.